This summer, my sister, Mary Pat, traveled to Italy on a bike tour. One of the advantages of biking through Italy is that you can eat anything and everything you want and not worry a bit about the calories. Turns out, my sister’s favorite dish was actually a healthy dish of local zucchini, tomato sauce, basil and fresh mozzarella. It was served to her in a generous square like lasagna, but instead of noodles, the layers were made up of thinly sliced zucchini. Once she got home, she started experimenting and re-creating what she ate from taste memory_and of course she told me about it! It sounded so simple, yet so delicious that I had to try it. I have now made it three times and decided to write it down and pass it along since there is still so much beautiful zucchini and squash available in the farmers markets. Better yet, in most towns, you can buy good zucchini all year long. This is one of those dishes where the whole is greater than the sum of the parts. This dish has the simple flavors of Italy_tomatoes, basil and mozzarella_layered between thin slices of zucchini but the end result is positively addicting. Once you make it, you will find yourself making it again and again like my sister and me. It is savory and just rich enough to be crave-able but light enough that you feel like you are eating a dish straight from the garden. My sister urged me to add tomato paste to the crushed tomatoes to make the sauce thicker and the tomato paste also makes it more flavorful and robust. I added some seasonings to compliment the vegetables including granulated garlic and herbes de Provence. If I had had a mixture of Italian seasonings, I may have used that instead. Either will work equally as well as they both typically include basil, rosemary and thyme. 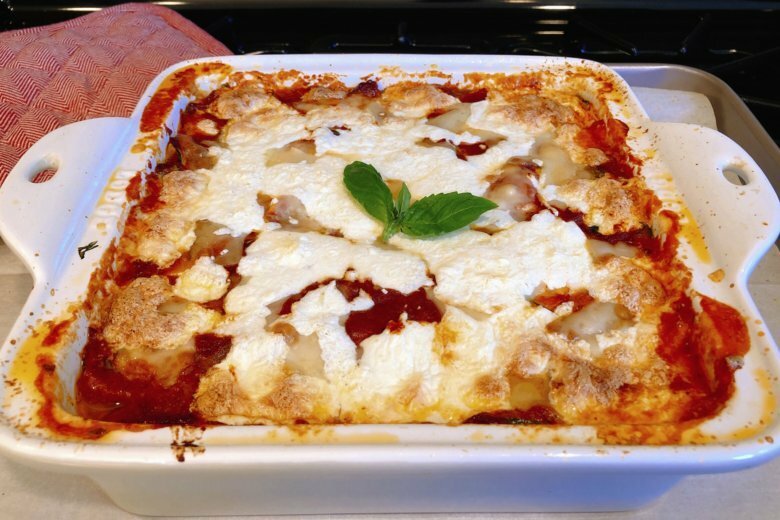 I also added shaved Parmesan cheese to each layer as it adds a “meatiness” or umami that contributes to the savory nature of the dish. Before you assemble the dish, you must slice the zucchini with a mandoline and salt it to remove the excess moisture. The slicing of the zucchini, and prepping it for the casserole is a little time consuming but it is well worth the effort. It helps reduce the amount of liquid that cooks out but it also seasons each slice of zucchini making for a perfectly balanced dish. If you’ve made zucchini before without any salt, you know that it has a tendency to be a very bland vegetable, so this step is important. You also need to rinse the excess salt from the squash or the dish will be too salty. And, you need to dry the zucchini. The beauty of this dish is that you can make the dish in advance and bake just before serving, or make it and re-heat it. It’s just as good re-heated as it is freshly made. This weekend, I made the zucchini gratinato and served it with beer-can chicken and cornbread, it was a dinner that delivered on taste, but was easy on the cook_and that is my favorite way to eat and entertain! Clean and trim zucchini_you can use a combination of yellow squash and zucchini if you like. Using a mandoline or a v-slicer, slice all the zucchini into thin rounds. Sprinkle with kosher salt as you fill a colander with the slices. Let sit for 30 minutes. Some liquid will drain out of the colander so place in a clean sink or put a dishtowel under the colander. After 30 minutes, run cold water over the salted zucchini slices for several minutes and toss the zucchini with your hands to make sure all layers are rinsed. Wrap the rinsed zucchini in clean kitchen towels to dry and drain. You want the zucchini to be as dry as possible. I divide mine into two different towels to dry. Meanwhile, mix crushed tomatoes with the tomato paste, herbs, salt and pepper. This will be your tomato sauce for the layers. Reserve one cluster of leaves for garnish and cut the rest of the fresh basil leaves into chiffonade or tear into pieces and set aside. Slice the fresh mozzarella into slices and squeeze between paper towels to absorb excess moisture. Tear into pieces. Preheat the oven to 400 F and assemble the dish. Begin the laying process by coating the bottom of a 9-by-9-inch baking dish with olive oil. Lay down the squash in an even layer about 3 deep and make sure the layer is even. Spoon one-third of the tomato sauce on the squash and spread evenly. Scatter the basil, a third of the mozzarella and a third of the parmesan cheese over the squash. Repeat with the remaining squash dividing it between 2 layers. The top of the zucchini gratin should be the tomato sauce, basil and cheese. Cover the casserole with foil and bake for 15 minutes covered at 400 F.
Remove the foil and reduce the oven temperature to 350 F. Continue baking for another 45 minutes or until bubbly and the cheese is brown. Let sit for 10 minutes and garnish with the reserved basil leaf. Cut into squares like you are cutting lasagna. It’s just as good made ahead! Make as directed and re-heat in a 325 F oven covered for 45 minutes the day you want to serve it. When I re-heat the dish, I pour out any excess liquid that has collected in the pan before placing it in the oven. Nutrition information per serving: 182 calories; 107 calories from fat; 12 g fat (7 g saturated; 0 g trans fats); 32 mg cholesterol; 393 mg sodium; 8 g carbohydrate; 2 g fiber; 4 g sugar; 11 g protein.